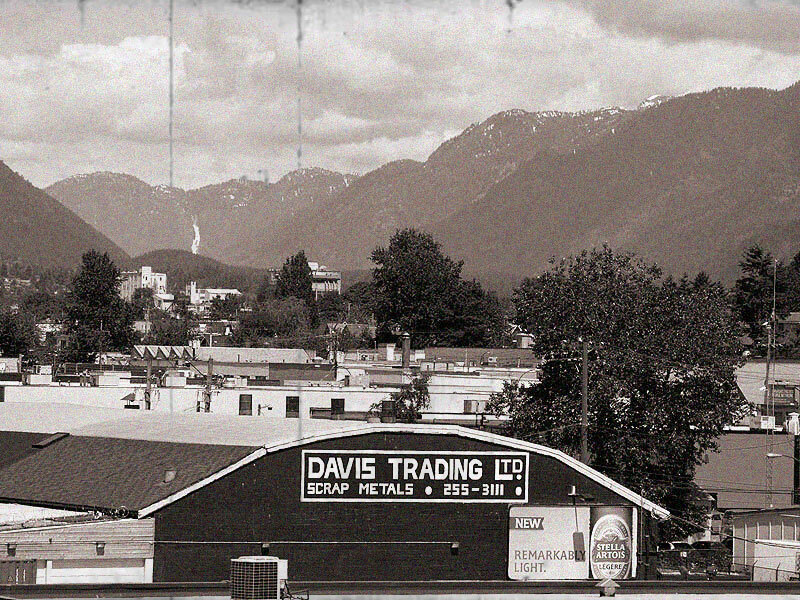 History - Metal Recycling in Vancouver - Davis Trading & Supply Ltd. Early Years: Founded in 1909 by David Davis, Davis Trading has had a couple variations of the current name. Among the retired names, the most recognizable, at least from looking at history, is Davis Junk Co. It has also been located at a couple different locations, although the 1100 Grant Street spot is still the longest tenured site. In these early years not everything salvaged was metal – conversely, lots was not. Bones were once traded – never on location in Vancouver – as well as bottles, inner tubes from tires, cotton from old mattresses, and rags. Davis Junk Co., as it was known then, dealt in horse hair for mats and sand bags for flooding as, at the time, there was no dyke system to prevent the Fraser River from overflowing into the city’s lower levels. Adolescence: Davis Trading grew up slowly, like most companies; and did not find it’s niche right away. After nearly 50 years in the industry, most of the non-metal trades had went by the wayside. Synthetics had swept into the rags/cotton industries, dykes had been built or were being planned for, and bottles and bones were just no longer profitable. Growing up has it’s aches and pains, but for Davis Trading it was fairly straight-forward as the family always understood that “non-ferrous was the profit center”, to quote the third generation head of the company, Mel. The location has changed a couple times, and those can be liken to the pains of growing up for a business. Once, during the early years of having transitioned to trading ferrous and non-ferrous metals, Davis Trading did business with the movie The Sand Pebbles starring Steve McQueen, filmed by 20th Century Fox. We sold the engine that was ultimately used for the ship – the movie is about a captain and his love for his ship’s engine. Definitely one of the highlights of those years. Visit again for more updates on what to expect from Davis Trading in the future.